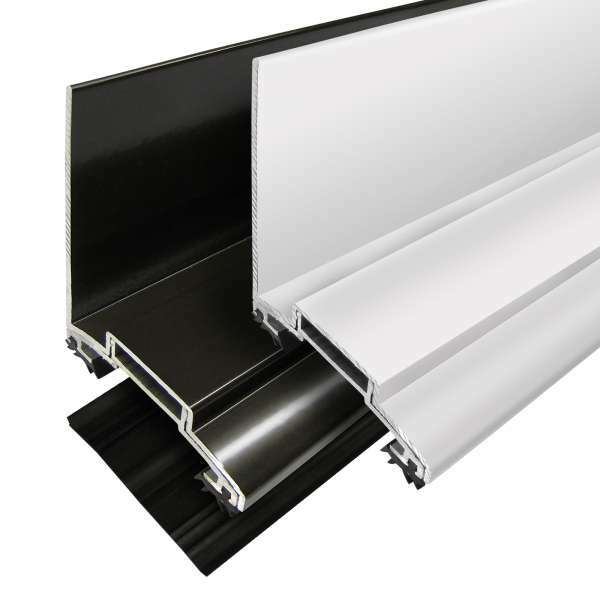 Product information "60mm ALUKAP-XR Glazing Wall Bar"
Superior sealing at wall abutment! Premium quality, Inner Capping for 60mm (2 9/25") timber rafters abutting a wall. The Wall Bar comes as three parts, a mill-finished aluminium Inner Capping, an aluminium powder-coated Wall Outer Capping and cast aluminium End Cap. The Inner Capping gets screwed to a rafter and its rubber gaskets create a water-tight seal over the glazing. The durable Wall Outer Capping snap-fixes securely over the Inner Capping to conceal fixings and prevent water ingress. Wall Outer Capping extends upwards to form a high up-stand that can be over-flashed if required. A heavy duty End Cap provides secure and decorative closure to end of bars, while helping to prevent slippage of glazing material. Shape and height of the 60mm Wall Bar compliments the 45mm and 60mm Main Bar, so can be used together on the same roof. It is available in a choice of colour, length and with or without 45mm and 55mm base gaskets. * If fitting with glass, or polycarbonate, which does not extend across rafter to wall, then a timber packer should be used to the same height as the glazing material. ** Ribbed backing of upstand is a suitable surface for sealant and the upstand can be over flashed. Related links to "60mm ALUKAP-XR Glazing Wall Bar"
Customer review for "60mm ALUKAP-XR Glazing Wall Bar"